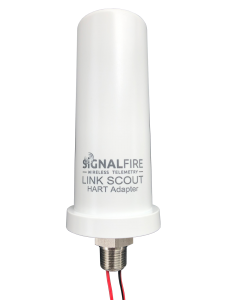 The Link Scout is a wireless adapter for loop powered 4-20mA HART instruments allowing HART connectivity with asset management software like PactWare, FieldCare, DeviceCare and most FDT based software. The Link Scout is powered from an internal intrinsically safe battery and wired in parallel to not interfere with the existing 4-20mA loop. 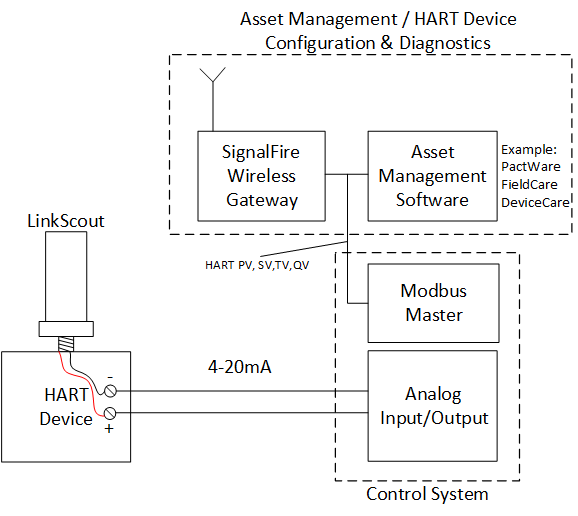 It will poll the HART instrument for its dynamic variables and alarm status to then transmit to the SignalFire gateway as Modbus registers. The Link Scout tunnels also all the HART traffic to an asset management software allowing full configuration, calibration and troubleshooting using the manufacturers DTM software.